In the last two decades, both the conception and the practice of participatory culture have been transformed by the new affordances enabled by digital, networked, and mobile technologies. This exciting new book explores that transformation by bringing together three leading figures in conversation. Jenkins, Ito and boyd examine the ways in which our personal and professional lives are shaped by experiences interacting with and around emerging media. Participatory Culture in a Networked Era will interest students and scholars of digital media and their impact on society and will engage readers in a broader dialogue and conversation about their own participatory practices in this digital age. "Jenkins, Ito and boyd offer us all a wonderful gift in the form of this book — it’s as though one gets a chance to listen in on a great dinner party conversation between three brilliant scholars, reflecting on more than twenty years of trenchant scholarship on culture, play, identity, and the emergence of the digital world." "These authors practise what they preach! To unlock the promise of participatory culture, Jenkins, Ito and boyd invite us to join their intellectual conversation as they puzzle over the dilemmas, insights and challenges of living in a networked era. This is an exciting way to engage with a fast-developing field of research, knowledge and experience." "The idea of scholarship as dialogue is one that lies buried deep within the humanities. In the pages of this engaging and accessible book, Jenkins, Ito and boyd have brought the ethos of dialogue very much to the surface. Their conversation is an entirely apt technique for reflecting on what is by now a sustained history of collaboration on questions of informal learning, participation and power in the evolving digital media environment." 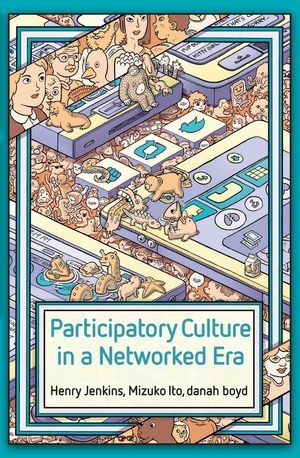 "Participatory Culture in a Networked Era is an instructive resource for students, researchers and academics alike while casual readers will also find it informative and engaging."